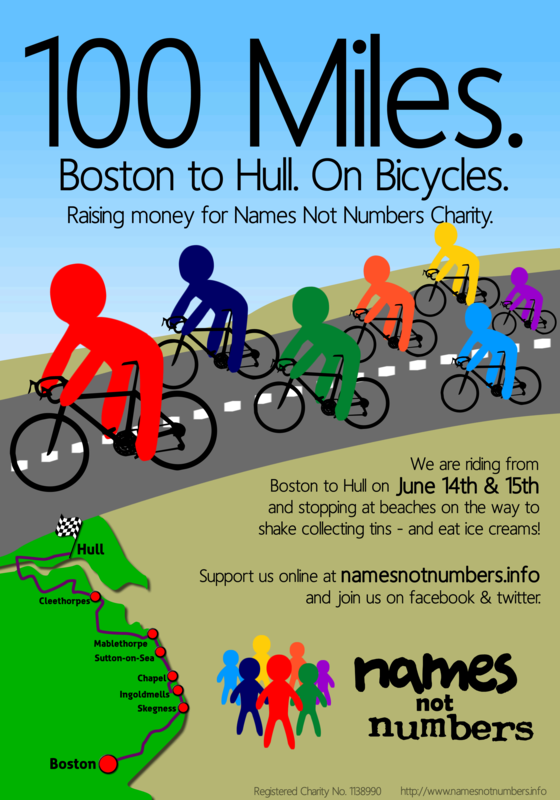 Chris and Phil, Names Not Numbers trustees, are going on a sponsored bike ride from Boston to Hull. It’s 104 miles, and we are doing it on the weekend of June 14th & 15th. We are hoping to raise at least £100 each, so please donate below if you want us to achieve that! If you are interested in coming on the bike ride, helping out, or just donating to the cause, please send us a message through the contact page. We will be biking from Boston, then stopping to rattle collecting tins at Skegness beach, Ingoldmells, Chapel, Sutton-on-Sea, and Mablethorpe, and after a busy 65 miles, camping before Grimsby. On the Sunday, we will stop off at Cleethorpes beach, again rattling tins and eating ice cream, before completing the final 40 miles to Hull town centre.